When someone starts looking for a trampoline, they may wonder which is really best because there seems to be a lot of name brands and shapes. Some say square is best, but is it? Read on to find out. 1.1 Are Square Trampolines Safe? 4.1 How do you measure a square trampoline? 4.2 Are square trampolines safer than round trampolines? 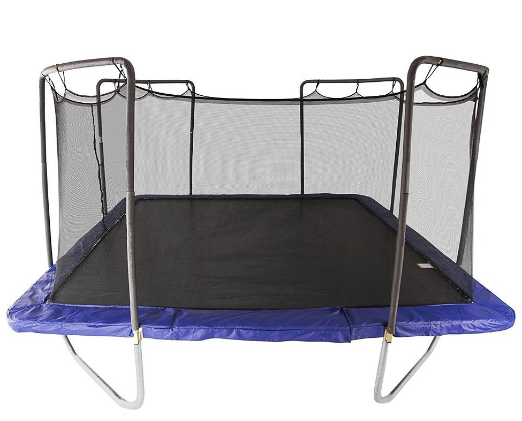 4.3 Are square trampolines cheaper than rectangular trampolines? 4.4 What is the best sized square trampoline? 4.5 Are square trampolines bigger? 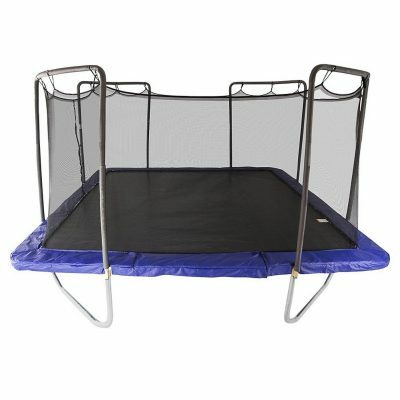 4.6 Do square trampolines have a high weight limit? To figure out which type of trampoline shape you need, you need to first discover what makes each one unique and then compare the pros and cons of each. Below you will first see the other types, followed by why many feel that square is best for most people. Rectangle trampolines are typically used for extreme bouncers. They are most often used for gymnastics. They are sometimes pricier than others because of their ability to be extra springy and due to all of the extra support that goes into them. A round trampoline is often made with a lot of support, even though they do not have the extra-long sides. They are not ideal for some families because of the weight limit restrictions. In most cases, they can hold 200-400 pounds and this will vary greatly by how much you spend and the size you get. Round trampolines are most commonly associated with backyard fun. They tend to be easy to add accessories to and are very affordable. Like rectangular trampolines, an oval shaped trampoline offers more bouncing surface and less chance of all jumpers being put into the middle. Not all springs will work at the same time, and the jump experience on the outer edge of it is just as good as the bounce in the middle. It also allows people to feel as though they have more space than the traditional round style trampolines, without adding a whole lot of extra cost to it. Octagon trampolines are the most expensive of all backyard fun trampolines. The main thing that makes them popular among some people, is the simple fact that they are different. They are just more appealing, according to some people. With square trampolines, you have a safe, fun way to get exercise. However, one of the main things that people worry with is the amount of room that they will take up inside of the yard. For some reason, losing a square block of backyard area is harder for some people than losing a round area or some of the other styles. Personal preference should be your guide on whether you have the space for it or not. The square trampoline is ideal for families with small children or in situations where you prefer your child not jump too high. In most cases, the springs are crisscrossed which allows them to create a harder bounce that does not send the bouncer up high. This makes them a very safe choice when it comes to trampolines. You can further increase safety by buying a Springfree square trampoline. If you top it with an enclosure, it is guaranteed a good time for everyone. One of the major advantages of a trampoline square is that it allows bouncers of all ages to jump with limited fear of getting hurt, even if you do not have a safety net in place. However, if you are not sure that you trust the trampoline still, you can purchase a safety net to further make it safe. The square design will also allow a few jumpers to bounce at one time, and there are fun accessories that you can purchase along with it. If you are looking for a square trampoline for sale, there are a lot of reviews for you to consider on the web. Each manufacturer will claim that they have the best, so how do you truly know? Read these reviews of some top rated trampolines and discover why the Skywalker square trampoline may be best for you and your family. 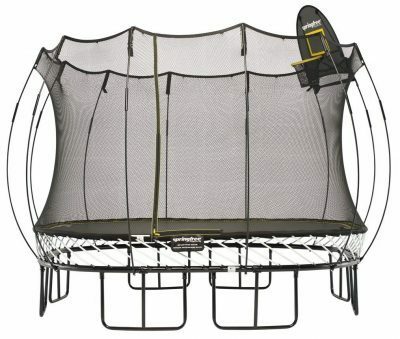 Provided you do not opt for the other big seller, the Springfree 11ft square trampoline. Click To See Best PriceThis square trampoline enclosure stays firmly closed, thanks to button holes that interlock and provide a gap free safety net. It also uses a reinforced T-Socket to stabilize the upper part of the enclosure frame which ensures that it will not twist over time. The legs provide a stable jump surface that will not bend and twist, even after years of use and it measures 21 feet on all sides to provide the maximum jump space available. Click To See Best PriceThis trampoline has a galvanized steel interlocking frame and the safety net is a unique patented gap free enclosure. It features 96 steel springs to give it the bounce that people will love. It meets all ASTM standards and in some cases, exceeds them. 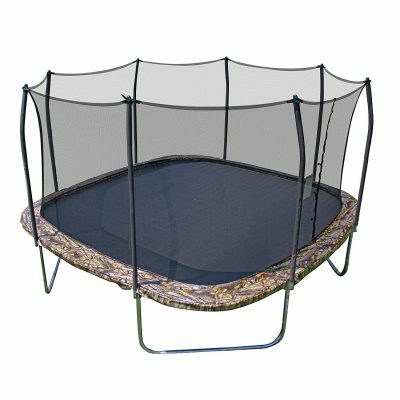 Some people like this square trampoline for sale best because it has a unique spring pad that is thick and covered with a camouflage cover. This is also offered in a Blue Color. Click To See Best PriceSpringfree trampoline are springless which makes them safer than traditional trampolines. It has a 250lb jumper weight capacity and 1100lb structural load capacity. The springfree trampoline features at rod based system to eliminate all springs. The entire frame is galvanized steel. Thanks to the double powder coated and galvanized steel frame this trampoline can be left outside all year around. This trampoline comes with a FlexrHoop (Basketball Hoop) and FlexrStep (ladder) which are great accessories. If you’re looking for the safest and highest quality trampoline on the market this is the trampoline for you. How do you measure a square trampoline? Measuring a square trampoline may look difficult, but it’s actually very easy and will only take you a couple of seconds to do. Begin by starting at the outer edge of the trampoline on either side. Since all the sides are equal in measurements, you only have to measure the one side to get your answer! All you have to do is measure one side across to the opposing side, and you’re done! However, make sure you’re measuring a fully built trampoline when you do this, and that you’ve built it properly. Measuring a trampoline that doesn’t have a jumping surface or the springs attached is a waste of time. You will get a completely different, incorrect measurement if you do it this way. For example, you’ll get 12 ft without assembling it properly, when it’s really a 15 ft square trampoline put together. Are square trampolines safer than round trampolines? With a square trampoline, it’s up to the jumper where they land once in the air. Round trampolines, however, always direct the jumper into the center of the jump surface. Because of this, it’s safe to say that round trampolines are a bit safer, but only if there’s one jumper at a time. If there are, for example, two jumpers on a round trampoline, they’re both going to be directed into the center. Safety, however, all truly depends on how many people are on the trampoline at one time, whether there’s a safety net in place, and whether or not the jumpers have some sense of trampoline safety and what they shouldn’t be doing while on one. 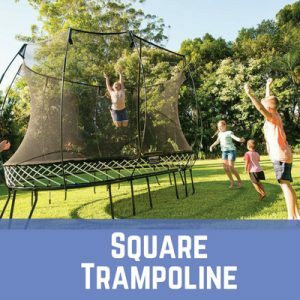 Are square trampolines cheaper than rectangular trampolines? In a sense, yes, trampoline square are generally cheaper than rectangular trampolines. In fact, a lot of rectangular trampolines are larger in size and are typically used for gymnastics. Because of this, square trampolines are usually cheaper than rectangular ones. What is the best sized square trampoline? The bigger the square trampoline, the better! A 15 ft square trampoline is one of the best sizes you can get. Having multiple jumpers on it at one time is absolutely no problem, whereas a round trampoline might cause issues if there’s more than one person on it. More often than not, yes, square trampolines are bigger than any other shape of trampoline. On average, a square trampoline has up to 20% more jump surface than a round trampoline built to be the same size. Do square trampolines have a high weight limit? Yes, they do. Most square trampolines are built using a higher gauge of steel. If they are, this means that they have a higher weight limit and overall stability factor when compared to other trampolines. This makes them the ideal shape as a trampoline, in general. Click this link to check out some of our other trampoline reviews.